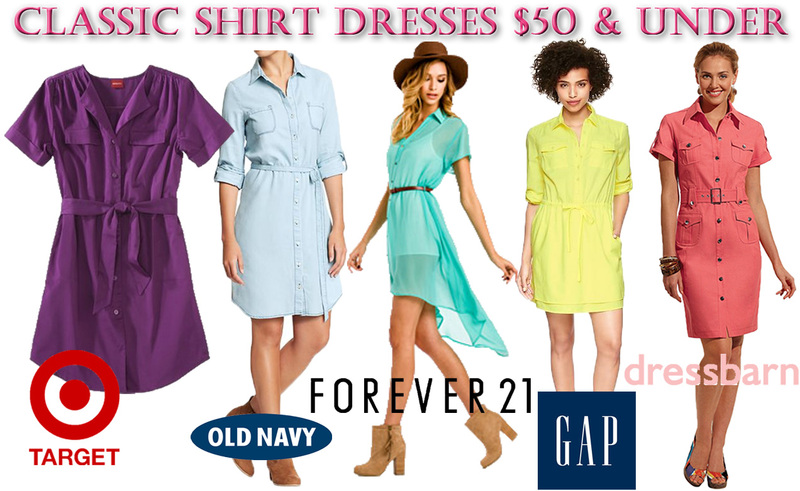 The Stylish Five: Spring-Ready Shirt Dresses ($50 & Under)! I’ve been focusing a lot lately on dresses b/c I think that spring is the best time of year to invest in new dresses. I’ve definitely already started my 2013 collection, which I will definitely wear well into the summer, however, one style of dress that I always turn to is the shirt dress. There are so many shirt dresses out there in stores & online right now, which are perfect for wearing to a brunch with girl friends, a family party on the weekend, or to the office for a feminine change of pace. The first I found is the Merona sateen belted shirt dress ($22.00) in purple from Target, which is also available in five other bright & neutral hues, & in sizes XS – XXL. This is the perfect dress for matching with a pair of espadrilles, ballet flats, or gladiator flats. Next is the chambray belted shirt dress ($24.50) from Old Navy, which can be made rugged with suede ankle boots or dressed up with cork patent heels, for a Style Darling of any size (XS – XXL). Forever 21‘s belted high-low shirtdress ($27.80) in turquoise is a soft & lightweight way to add layers to your look, or even mix things up with leggings & knee boots, or a matching suede hat & belt. To stay on trend with bold neons for spring, I picked the roll-sleeve pocket shirtdress ($34.99) in active yellow from Gap, which is also sold in blue, orange, & pink, in sizes XS-XXL. I recommend pairing it with pointy toe pumps & a printed blazer when headed to a meeting, or with floral flats & a basketweave clutch for a sunny picnic. Lastly, the belted denim shirtdress ($46.00) in orange from Dress Barn is also sold in plus sizes ($50.00) to wear with peep toe wedges & a chainlink bag. What dresses are you shopping for this spring? What stores do you like to hit up when searching for that perfect dress? Do you like to wear shirt dresses? For more affordable fashion posts, check out nautical inspiration for under $100, Derek Lam’s DesigNation collection for Kohl’s, spring-friendly polka-dotted pieces, peplum tanks inspired by Olivia Palermo & Zoe Saldana, & floral must-have pieces like Selena Gomez & Jessica Chastain! Happy Styling! This entry was posted in Quickie Darling Deal & Steal, Style Darling Daily, The Stylish Five and tagged chambray dress, Dress Barn, Forever 21, Gap, Merona, neon dress, Old Navy, Quickie Darling Deal & Steal, shirt dress, shirtdress, Target, The Stylish Five. Bookmark the permalink. ← Cover Craze / Watch This Style: Drew Barrymore’s May 2013 Lucky Cover Shoot!